The A team had a challenging encounter with an experienced Oakmere team today as they played their last league game of the season. Oakmere's physical strength showed from the start, as their striker powered through our defence to put them 1-0 up after only sixteen seconds. Despite some excellent defending from Megan, Evie and Bailey, we soon found ourselves 2-0 down after, once again, being muscled off the ball. The game took a turn in our favour, however, when a tremendous challenge from Emily led to an expertly executed pass forwards to Enya. Enya's skill and speed caused havoc for Oakmere, and they could only watch as she picked out Grace, who was unmarked on the penalty spot. Grace kept her composure and fired into the bottom corner to give us a goal back on the break of half-time. In the second half, we created plenty of chances going forwards with Kiera's impressive pace, yet had to work tirelessly in defence as the physical challenges kept coming. Ruby played tremendously well in goal, making a string of brave and committed saves, in order to keep the score line down to a very respectable 3-1. Unsurprisingly, the opposition crowned her as the Player of the Match, which Miss Kropman wholeheartedly agreed with! The A team had a double header of matches this afternoon against local rivals Cuffley and Little Heath. The first match saw us go 1-0 down early in the first half, but a fantastic equaliser from Enya just moments before half time was the start of an incredible turnaround. In the second half, Enya completed her hat-trick with a further two well-taken goals, whilst Melanie and Kiera also got in on the scoring act. Despite Cuffley pulling two goals back late on, fantastic defending from Megan and Emily gave us a well-deserved 5-3 victory. The opposition awarded player of the match to Enya, which Miss Kropman very much agreed with! In the second game, we played an experienced and strong Little Heath side who, after having much of the first half possession, took a 1-0 lead into the break. Some rousing words from super skipper Evie and injured supporter Bailey resulted in some excellent determination and, shortly after, an equaliser came our way courtesy of a wonderful assist from Melanie and finish from Enya. Once again, our midfield combined just seconds later, with Grace's inch-perfect pass leading to Enya finishing from a tight angle to give us a 2-1 lead. Hearts were in mouths when Little Heath had not one, but two, one-on-ones with our goalkeeper, but Ruby (Miss Kropman's player of the match) stood tall and strong to give us the win! Well done to Kiera, who was the opposition's player of the match, and to all of the squad for a wonderful afternoon of football. Thank you also to Mr Rogers, who kindly refereed both of our games today. 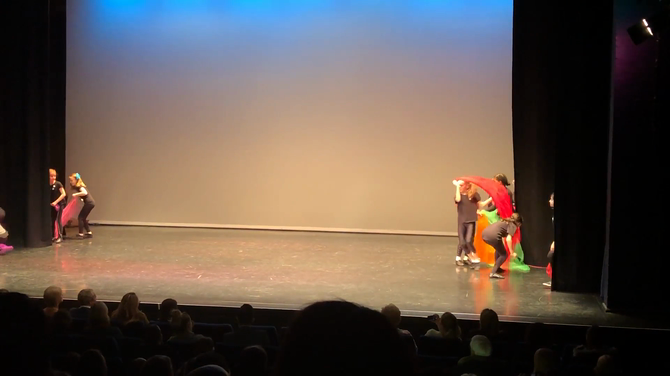 After being invited to enter a dance group to perform at the annual Sports Partnership Festival, Miss Melchionno choreographed an exciting routine to Eurovision anthem 'Dancing In The Rain'. Demonstrating six different styles of dance and an array of scarves and umbrellas, our seventeen talented girls wowed the audience at the Hawthorn Theatre in Welwyn Garden City and left the stage to rapturous applause! Both Miss Melchionno and Miss Kropman were present on the night and were extremely proud of the girls, who represented our school brilliantly. Thank you to Mr Dreblow for filming the clips below! The A team had an incredibly difficult fixture this afternoon against league leaders Ladbrooke. A strong and determined first half performance saw excellent defending from Emily P and Megan and two superb saves from goalkeeper Bailey. Despite going two goals down, a fantastic solo run and finish from midfield dynamo Kiera saw a brilliant end to the half. In the second half, a change of goalkeeper (due to injury) led to a fantastic performance from Ruby, whilst Grace and Evie continued to work tirelessly in midfield. Although we conceded a further two goals, Enya's awesome finish gave us a very respectable 4-2 score line. Well played, girls! Miss Kropman and the opposition were pleased to award Player of the Match to Evie today. The A team began their competitive league fixtures today with a tough home encounter against a very experienced team from The Wroxham. The first half began brightly, with midfield dynamos Melanie and Grace racing down the wings to create some dangerous attacking play. Despite bold defending from Emily and Kiera, however, we soon found ourselves 3-0 down thanks to the opposition's talented strike-force. Enya pulled a great goal back for us after Evie's bold run into the box led to a goal-mouth scramble, but this was sadly not enough as the visitors scored either side of the half-time interval to eventually run out 5-1 winners. As a tribute to our girls' excellent play, both managers decided that a fun penalty shootout would be an appropriate way to end the afternoon, and Miss Kropman is delighted to report that we won this 3-2! Bailey was outstanding in goal, saving three penalties is a row(! ), whilst our penalty scorers - Evie, Enya and Grace - all used blistering pace and accuracy to fire into the back of the net. Well done, girls! The House Cross Country Competition was a great success last week. All the children, Little Gems to Topaz, took part and showed that the training put in during their Mile a Day has really paid off. All the finishers gained house points for their teams and these were added up for the end of half term total. Our first fixtures event of the year took place week at Stanborough School last week. The girls played 3 games and won all 3. The scores were 11-4, 8-0. 14-0. The girls played really well as a team and worked hard to move, pass and find space. Their communication was excellent and that is reflected in the fantastic scores. Well done girls! On Friday 5th October, Enya, Grace and Melanie from Year 5 and Bailey, Emily P, Evie, Kiera and Megan from Year 6, travelled to Monk's Walk School in Welwyn to take part in the Sports Partnership Football Festival. This was not an inter-school event and, rather than play together as a team, all eight of our girls were made team captains, responsible for leading a group of up to twelve girls from a variety of different schools. During the afternoon, we played both five and seven-a-side games and enjoyed ourselves immensely! Miss Kropman was very impressed with the leadership qualities demonstrated by all of our girls and was delighted to see the excellent football being played, which will set us up nicely for competitive league fixtures later this term! Well done to all of the girls, but a special mention should go to Enya and Kiera, who were awarded certificates from the Monk's Walk staff for showing brilliant ability within their matches. On Friday 21st September, the year 5 children took part in a Running Festival at Monk's Walk School. There was a Competitive run and also a Fun Run which all the children had the opportunity to take part in.They ran between 2km and 4km, depending upon which race they took part in. In the competitive race we had a some success as Oliver came 2nd place in the boys race, Georgia came 3rd, Eva 4th and Enya 10th in the girls race. All the children who placed in the top 10 have qualified for the Partnership Finals next month. In the fun run we had a number of top ten finishers.